December 21 – The shortest day of the year, the winter solstice. The most darkness: a space for ritual, for strange spirits to emerge. Sol Sistere (the Latin origin of the word solstice, meaning sun stands still) is a one-night exhibition of time-based work relating to darkness and the often dark, porous boundaries between the physical and spiritual world. Building on the solstice’s connection to earth-based, non-Christian religious practices and astrology, the exhibition examines art-making as ritual and representation as a metaphysical practice. The durational nature of the work included – installation, performance, film, and projected photographs– reaffirms the role of the solstice as a marker of time passing. The exhibition also emphasizes the historical association between earth-based, pagan religious practices and queerness. As elaborated in Arthur Evans’ Witchcraft and the Gay Counterculture, the demonization of earth-based alternative religions – beginning in early civilizations, and solidified with the advent of Christianity – often occurred concurrently and in close connection with the persecution of (previously acceptable, culturally sanctioned) homosexuality. Drawing on this history, Sol Sistere presents a queered look at, and celebration of, the winter solstice. 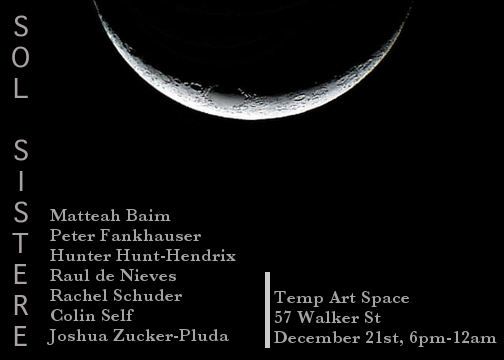 Artists in Sol Sistere are Matteah Baim, Peter Fankhauser, Hunter Hunt-Hendrix, Raúl de Nieves, Rachel Schuder, Colin Self, and Joshua Zucker-Pluda. The exhibition is organized by Dana Kopel with Peter Fankhauser.